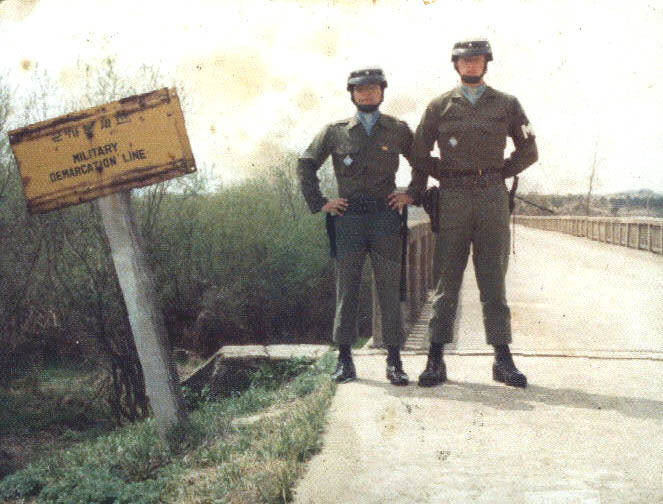 Photo provided by "Robert Poorman"
Pictured here standing in front of the "Bridge Of No Return", is PFC Robert Poorman and an un-identified S. Korean soldier. Year 1979. At the end of the Korean war, both North and South Korean people were given the opportunity to cross this bridge for one last time. Once the bridge was closed a few days later, neither could return. Hence the name, "The Bridge Of No Return".